It's been way too long since I've written anything, much less blogged with any regularity. I have some other blog friends who have dropped of the radar also. Guess it's that "a time for every season" thing. 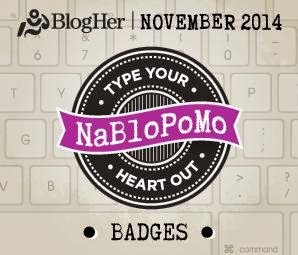 I'm going out on a limb here by announcing, I've decided I'm going to kick start my writing by in participating in NaBloPoMo (National Blog Post Month). The rules are pretty simple, I just have to post something every day. I am hoping that attending the 3rd Annual Chat Noir Writers Circle Mountain Retreat will help me get in the swing of things. The 8 hour ride to Blue Ridge, Georgia, will be good for a few posts all by itself. Five women, a wheelchair, art supplies, food, a cooler and maybe a desktop computer and monitor all packed into a Dodge Caravan. Suitcases will be piled on top, Beverly Hillbillies style. I haven't yet figured out who will out the suitcases up there. Katy and I are tall enough but both have physical conditions that make it unwise. Amy gets to sit and watch from her wheelchair vantage point. Neither Carol nor Diane are very tall. They are, however, creative and determined women. I suspect this challenge will be short-lived. So if you are still one of my blog followers, I hope you'll join me on my adventures. You can keep me motivated by leaving comments or asking questions. I would appreciate it.